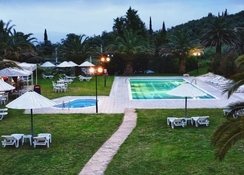 Rebecca's Village is a family-run property located in Karousades, Corfu. Perfect for anyone searching for peace and tranquility, Rebecca's Village is a charming property with spacious gardens and air con throughout its public spaces. This hotel is just a stone’s throw from the beach, but also runs buses to and fro, and is a short stroll from gorgeous Sidari town centre. Guests can use the pool, where the bar offers drinks and snacks, and Rebecca's Village has a children’s playground as well. Rebecca's Village has some sports facilities on its vast grounds, however the nearby beach offers more lively games and activities. Rebecca's Village plays host to a not too rowdy nightlife, inviting guests to enjoy cocktails into the evening. 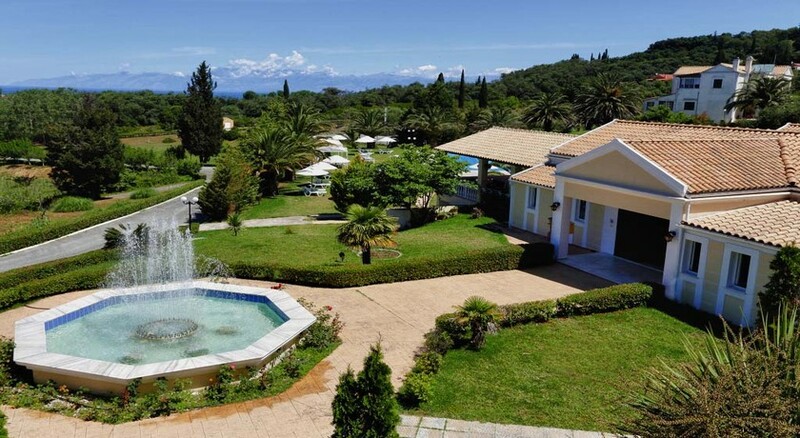 Rebecca's Village is not far from Sidari’s centre, and therefore is close to a range of shops, restaurants, and bars, as well as lots of activities and tour opportunities. The resort runs a shuttle to the nearby beach and is close to a bus stop, for those who want to explore further. Rebecca's Village is a perfect choice for those who love walking the country lanes that link the resort to surrounding villages and attractions. From the resort guests can find Angelokastro, a Byzantine castle built on the highest peak of shoreline. 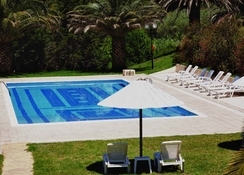 Rebecca’s Village is just over an hour’s drive from Corfu airport. Rebecca's Village maintains 50 luxury studies and apartments, spread over three floors. Each room here sleeps up to four adults comfortably, with either One or Two-Bedrooms. 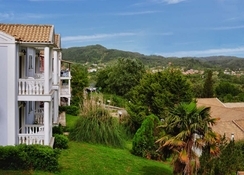 Rooms have useful amenities such as a private bathroom, TV, and air con as standard, and each room has a pleasant view from its own private balcony or terrace. Perhaps because its family owned, or because of its quirky character, Rebecca's Village promotes a social stay, with neighbouring guests often becoming acquainted during their stay. That said, each room is private and allows for families and couples to enjoy quality time together. Rebecca’s Village is handicapped accessible. Rebecca's Village has an on-site restaurant, serving a fresh breakfast every morning and offering snacks and light refreshments throughout the day. Dinner is a buffet of Greek flavours and specialities, but international options are served alongside. Children’s options are available, and special dietary requirements will be catered fro upon request. Rebecca's Village often hosts ‘Greek Nights’ where traditional food and local wines are plentiful, and guests are encouraged to dance traditional Greek dances! 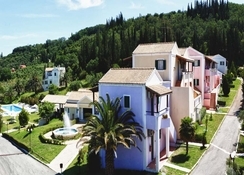 Corfu offers many great restaurants to dine at, and a short walk into Sidari centre or Kaorusadis village will give guests endless options to try authentic Greek dishes. Rebecca's Village offers a beautiful pool, easy beach access, and lots of evening entertainment. Greek nights are a hugely social event where guests can mingle, and BBQ nights, pool parties, and Happy Hours add to the fun. Rebecca's Village has lots of activities on offer such as tennis, bicycle rental, or horseback riding in the mountains. Rebecca's Village is close to Canal D’amour and Mount Pantokrator slightly further afield. Active guests will be keen to check out Cape Drastis which offers a stunning view from its sculpted, white cliffs, and where peculiar rock formations have become a natural playground for explorers. The room in the hotel was amazing! It has loads of room with comfortable beds. The only problem was, the matresses would easily slip off the bed. The food was poor though, it was all lacking in flavour and was mostly catered for Polish. There was also not slot of choice when it came to the food. Overall very poor in that area. The pool was nice however the bars were lacking variety of drinks and snacks. Friendly staff, however they never knock. The hotel was as about a 25 minute walk into town. There is 2 ways of walking however and one takes about 15 minutes. As the most of the food was catered for the Polish, most of the guests were also Polish. There was one bristish couple there and didn't have much conversation with anyone else there. As it goes for entertainment wise, there was not a lot either. Sidari it's self was lovely. A great place for a first couples holiday and a holiday for drinking and having fun. Corfu is also a lovely island too. Nothing is really far away. About an hour to everything. Great choice of excursions, cars and quad's are okay prices too.